The divorce drama between Billy Ray (Miley Cyrus father) and his wife Tish has taken another turn on the father as his daughter, Miley is warns him to "tell the truth" about his mystery woman relationship or she'll blast him for the world to see via Twitter. 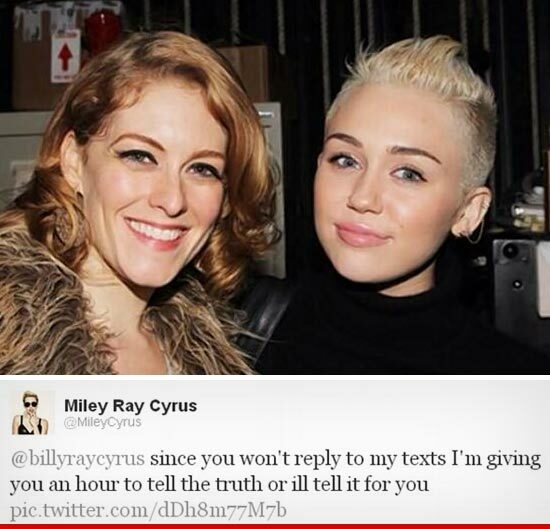 This fresh blackmail first appeared on Miley's Twitter, she tweeted the following to her father Bill... "Since you won't reply my texts i'm giving you an hour to tell the truth or i'll tell it for you." Following the relationship drama between Billy Ray and his wife, it is assumed Miley is suggesting that the mystery woman is somehow involved. Miley has since deleted the post. Meanwhile, an hour came and went and Miley didn't come through wit her threat, maybe daddy contacted her.